Will 2013 Be My Last Half Marathon? I’m starting to give serious consideration to hanging up my running shoes after the 2013 Rock ‘n’ Roll Half Marathon. This will be my 4th time doing the race and it seems like every time I train for a half marathon, I run a personal best, but I also go into the race more injured than the previous race. Here’s the breakdown of all my half marathons to date. For the 2011 race, I was barely able to train because of my shin pain. That was my most painful race ever. I started hurting during mile 2 and it got worse the more I ran. By the end of the race, you couldn’t hug me because everything hurt – including my internal organs hurt. I started using KT Tape when I was training for the 2012 race. I spent the last month of training with my leg taped up. By race day, I needed tape jobs on my leg and foot. This year I practically started training with my leg taped up and I added a foot tape job last week. I pulled back on the intensity of my training to let my legs rest a bit. My left leg did fine with last weekend’s 6-mile run/walk but now my right leg and foot are starting to hurt too. It makes me wonder if it’s time for new sport. Before getting into running, I was a gymnast for 17 years. I love being athletic. I was a competitive gymnast for 8 years and I had a plethora of injuries – shin splints, knee problems, back problems, and chronic foot problems. When I retired from competition, I was recovering from a stress fractured lower back. My doctor suggested I take up yoga. I joined a regular gym and I tried it. I found weight lifting to be boring and yoga was challenging, but it gave me no sense of accomplishment. I missed the pounding of my hands and feet against the ground and doing flips. I haven’t found a suitable substitute for gymnastics – there’s nothing like it. I’ve tried a few other sports but nothing’s clicked for me. I fenced for 1.5 years in college and that was pretty fun. On the advice of my coaches, I took swimming as a PE class when I was in college. I really tried to like it but it did nothing for me. I really didn’t like that I couldn’t tell when I was sweating. When I moved to Phoenix, I got into hiking because I didn’t think running was an option given my history with injuries. I enjoy getting out on the mountain trails, but it doesn’t give the sense of satisfaction I want. 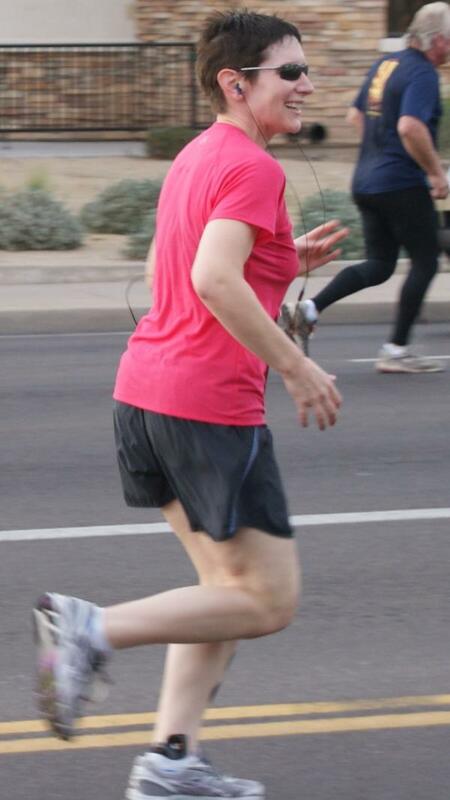 I openly admit that I don’t like running – I like being a size 4. I’ve learned that I won’t work out unless I’m training for something. With running, there’s always a race I could sign up for. I appreciate that training for a half marathon puts me on a 12-week structured training program so I have to work out 6 day a week. But now I’m wondering if it’s worth it to do it again after this race. If I give up running, I’ll need to replace it with something…and I have no idea what that would be.